Sweet Adelaide is a regular leaf dwarf variety that produces oblate medium to medium large fruit that ripen to a crimson pink color. The flavor is well balanced, on the sweet side, and the variety is quite prolific. Photo by Patrina. 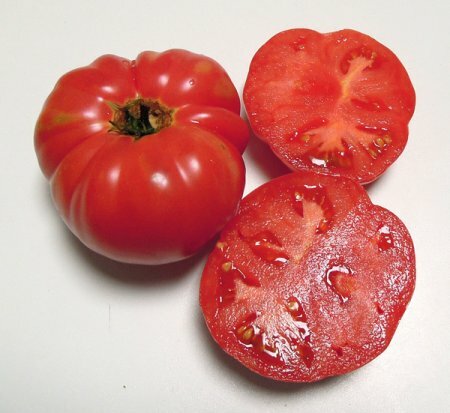 70 days from transplant – first offered to the public in 2014 by Sample Seed Shop and Casey’s Heirloom Tomatoes. Sweet Adelaide is a regular leaf dwarf variety that produces oblate medium to medium large fruit that ripen to a crimson pink color. The flavor is well balanced, on the sweet side, and the variety is quite prolific. It originated from a cross made by Patrina Nuske Small between New Big Dwarf and Paul Robeson, named Happy. Sweet Adelaide was selected and named by Patrina Nuske Small.